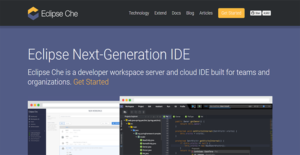 Eclipse Che is a next-generation, cloud-based IDE that can also serve as a developer workspace server for individuals, small teams, and enterprises. Though it is mainly deployed as a SaaS, it can also be installed to local hosts or shared servers. To give programmers more flexibility, Eclipse Che provides plugins for different programming languages, frameworks, and tools. The application’s API is also available to users to integrate with other platforms and to employ custom clients. These make the interface extensible, allowing developers to conduct multifarious tasks in one solution. Furthermore, Eclipse Che’s latest release includes a Permission API that lets administrative programmers control accesses to Che resources. This enables admins to properly allocate resources and to ensure the security of the use of the application. Eclipse Che supports single tenancy and multi-tenancy. The latter enables administrators to allow more users to access various workspaces and resources. This is especially beneficial to organizations with a dispersed workforce, allowing every team member to seamlessly collaborate with each other on a single window. For teams and enterprises, Eclipse Che offers the ability to onboard members to their respective workspaces using their local IDE or the Che browser-based IDE. This facilitates smooth collaboration between members, especially those who are working remotely. Furthermore, Eclipse Che affords administrators control over team grouping through its workspace organization and management tools. With these, administrative users can group and regroup users as well as shuffle the allocation of resources depending on the project and the need. Administrators have fine-grain control over user permissions in workspaces and with regard to the use of resources with Eclipse Che. These can be done through the authentication services like OAuth or SAML and Permissions API. These let them make sure resources are well-allocated and that these are accessed only by authorized users. Eclipse Che has been redesigned to allow users to focus more on their tasks. With the application, they are given an uncluttered environment that promotes productivity and enhances efficiency. Eclipse Che is now equipped with color highlighters. These are activated in the editor where the git status is displayed. With this feature, users can instantly act on the issue revealed and remediate them. If you are interested in Eclipse Che it may also be beneficial to examine other subcategories of Best IDE Software listed in our database of SaaS software reviews. Every company has different requirements and needs a system that can be customized for their size, type of staff members and customers, and the particular industry they are in. For these reasons, no system can offer perfect functionality out-of-the-box. When you look for a software app, first be sure what you require it for. Read some Eclipse Che reviews and ask yourself do you need basic functionality or do you want advanced features? Are there any industry-specific tools that you are looking for? Find the answers to these questions to aid your search. There are lots of aspects that you need to mull over and these include your budget, specific business needs, your organization size, integration requirements etc. Take your time, use a few free trials, and finally choose the app that offers all that you require to enhance your organization competence and productivity. How Much Does Eclipse Che Cost? Eclipse Che is an open-source IDE and is free to use for individuals, teams, and enterprises. There are no enterprise pricing plans. We realize that when you make a decision to buy IDE Software it’s important not only to see how experts evaluate it in their reviews, but also to find out if the real people and companies that buy it are actually satisfied with the product. That’s why we’ve created our behavior-based Customer Satisfaction Algorithm™ that gathers customer reviews, comments and Eclipse Che reviews across a wide range of social media sites. The data is then presented in an easy to digest form showing how many people had positive and negative experience with Eclipse Che. With that information at hand you should be equipped to make an informed buying decision that you won’t regret. What are Eclipse Che pricing details? What integrations are available for Eclipse Che? The Eclipse Foundation provides API documentation to developers for Eclipse Che. If you need more information about Eclipse Che or you simply have a question let us know what you need and we’ll forward your request directly to the vendor.